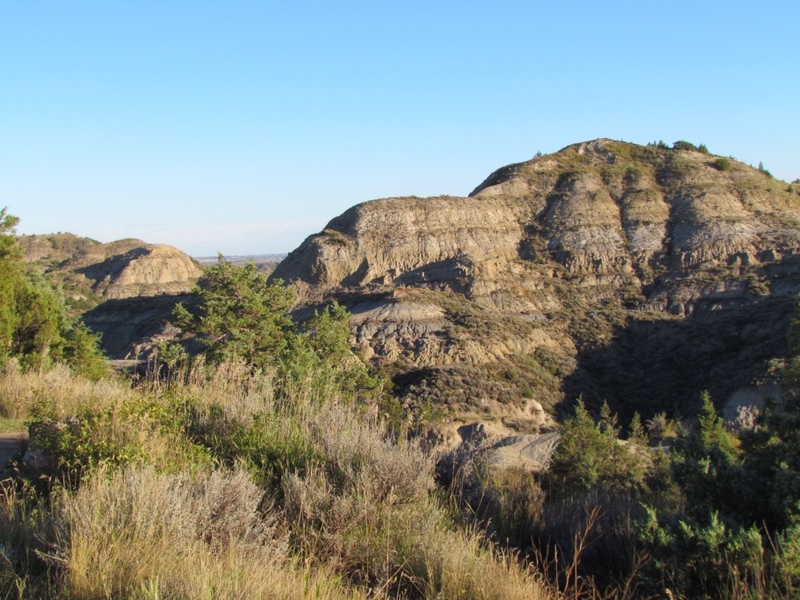 I admit I didn't even know there was a Theodore Roosevelt National Park. But if I think about my history lessons, it seems more than appropriate that this man who set aside millions of acres of land for conservation purposes has a park honoring his name. Making our way westward to begin our cycling trip, the Cottonwood Campground in this park was our targeted destination for our first night's stay. 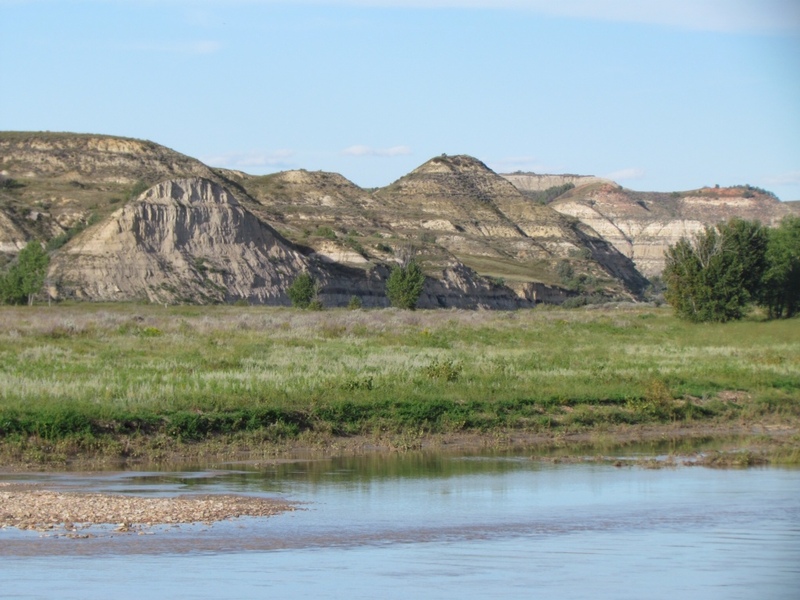 As we neared Medora, North Dakota the scenery developed the unique features of the Badlands. Buttes with distinctly colored strata interspersed wtih canyons covered in grasses and prairie shrubs dominated the landscape. Some of the mounds were more volcanic with fascinating shapes that resembled sand castles. Theodore Roosevelt National Park is as understated as its reputation. It is an unassuming park whose greatest features are its natural beauty and wildlife. 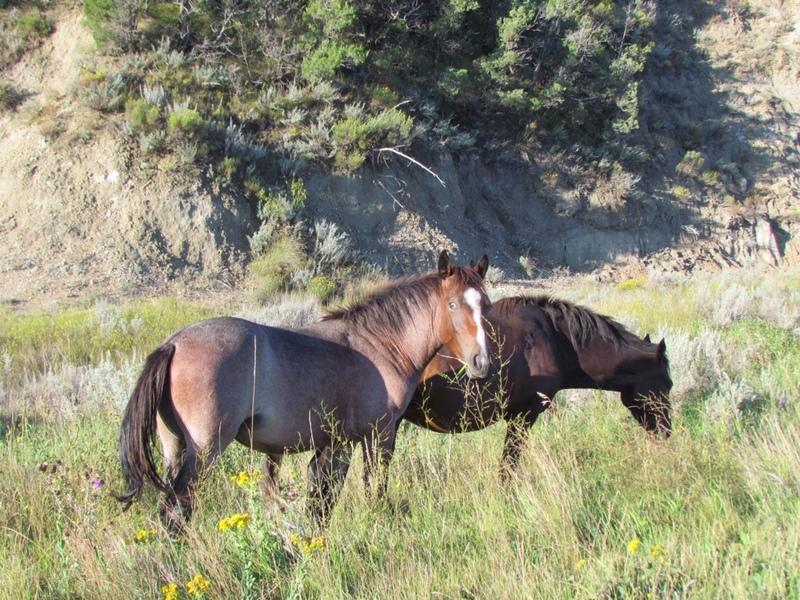 Its major activities are scenic drives and trails for hiking and horse back riding. Even our campground provided only the most basic of services. But it bordered a river and was tucked right into the dramatic sculptures of the land, which was of more interest to us anyway. Up with the sun in the morning, we set off on the 36 mile circle drive through the south unit of the park. We had originally planned to cycle the route, but time constraints dictated that we cover it by car instead. The sky was blue and cloudless, and the rising sun set off the scenery to its greatest advantage. In addition, the park's natural inhabitants seemed to be especially active and abundant. 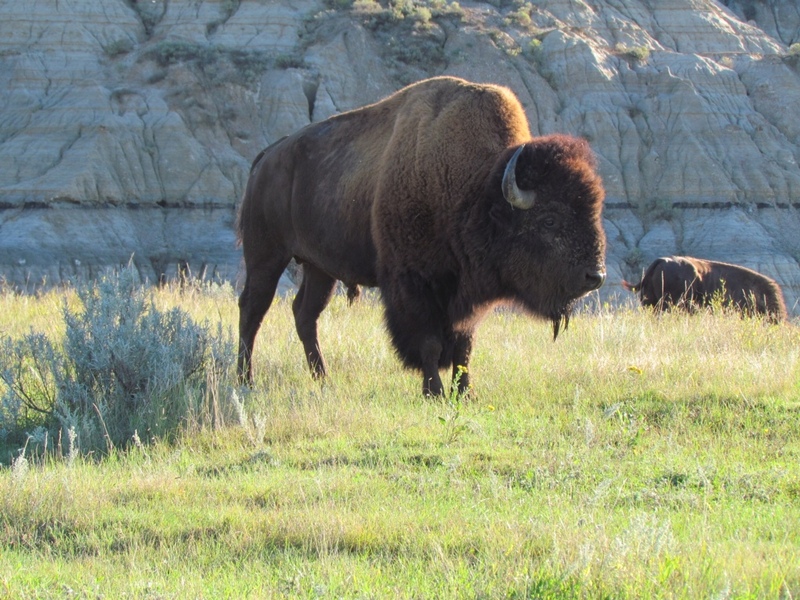 Bison and wild horses dotted the landscape, and didn't seem to mind us passing by in close proximity. Prairie dog towns were frequent and bustling with activity. The little critters chirped at us in annoyance yet carried on popping in and out of their holes, keeping us entertained as we tried to take pictures. The passing of Labor Day stripped the park of its peak visitors, leaving us to enjoy our drive in near solitude. Rich could take in the sights even while navigating the narrow curvy roads, and we took liberties with stopping to gawk or take photos. It was the ideal way to take it all in. In sharp contrast, we are now headed to one of the best known of all U.S. National Parks – Glacier. I expect we will share its grandeur with a few more visitors. But the benefit is that its glory has been preserved for future generations. I think Teddy Roosevelt would approve. This entry was posted in Travel and tagged Camping, Travel by Molly. Bookmark the permalink.